If you have a website with high traffic then you may have considered Amazon Web Service (AWS) to host your website. Surprisingly there are many people who are still unaware of AWS despite all the benefits. Recently, I have come across similar questions in a WhatsApp business group, so I thought I should write a post for those who need help getting started with AWS. Yes, it's a Cloudwith.me review. Cloudwith.me was founded by a couple of veterans who are experts in Online Marketing and all things Tech. They wanted to simplify AWS, so they decided to create a solution that automates the process to get you hosted on AWS in minutes, not to mention all the tricky configurations that are already done for you! There comes a time when shared hosting doesn’t meet your expectations due to high traffic, or due to the increasing need for more resources and bandwidth. This means it is time to move to VPS and dedicated servers, however, due to different factors such as low tech knowledge or even limited budgets many people avoid this and continue to struggle with shared hosting! Finally, Cloudwith.me have the answer to your problem, and you will not experience any technical or budget related issues. Cloudwith.me simplifies the tedious task of installing and migrating to AWS when shared hosting is no longer fulfilling your requirements. One of the main advantages of using Cloudwith.me is that business owners don’t need to spend their time and money in dealing with endless configurations (e.g. email, FTP, HTML, Wordpress, PHP, Analytics etc), leave that to the champions as they have everything covered. Most of these amazing features are automatically included in your FREE account, and there are a few add­ons available at $3.99 a month. They also give a 14-day free trial so you can try it out before paying for anything. But to be honest, the FREE package covers everything you need, and in my opinion, $3.99 is a small price to pay for Wordpress when it is already configured. When I compared this to other companies who get Wordpress installed on AWS, the lowest cost was more than 10,000% more ­ amazing right! Cloudwith.me provides a very simple powerful tool to handle all this, and it is reliable, inexpensive and I received lots of dedicated support for any queries I had (usually took a few minutes for them to respond!). As I said, Cloudwith.me bridges the gap between the old traditional hosting companies and AWS, making AWS accessible to everyone not just corporate giants anymore. 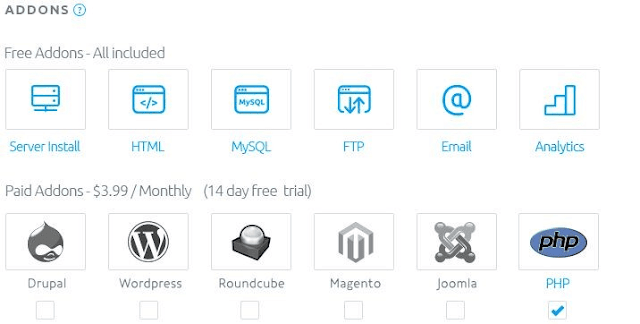 To get started with Cloudwith.me, you simply need to select the region you want to run your server in (Mumbai and Seoul have been added), choose server type needed according to your website requirements and also you have the option to choose from a range of add­ons, such as WordPress, Drupal, Joomla, Magento, Roundcube, and PHP. 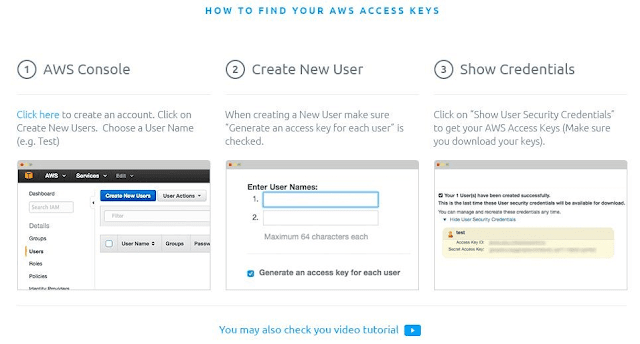 Just use Cloudwith.me sign up a link to get started with this amazing AWS solution. 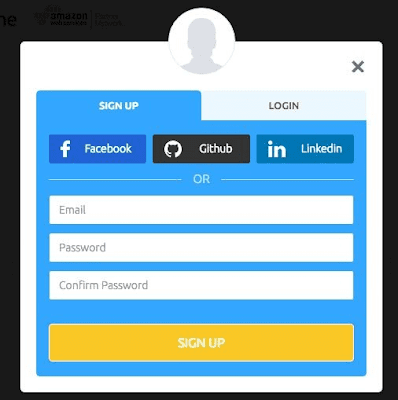 Another cool feature is that you can also sign up with existing accounts like Facebook, LinkedIn, and even GitHub. Once you’re in, you will be redirected to the first selection page so you can choose what you need, see screenshot below. Here you add the domain that you want to be hosted on AWS. 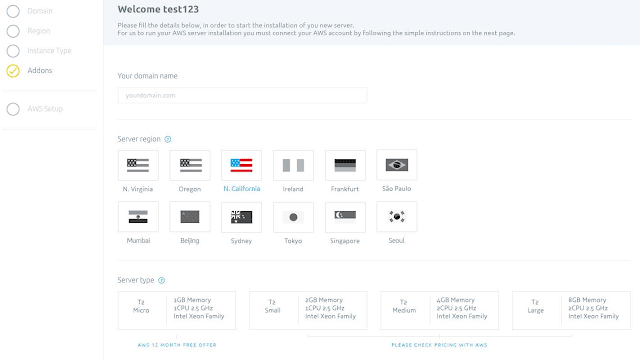 Once you select your server region and server type, you then have a range of add­ons as I mentioned before. For example, if you have, need or want a WordPress site (my favorite CMS), just select the add­on and you are done. I was very happy to see they have recently introduced a 14-day trial as this made me feel more comfortable about testing it out to make sure it did exactly what I wanted. To be honest, the fact that it is a free solution I can’t really complain as it allowed me to avoid the headache of all the usual configuration problems that come with AWS and hosting in general. As you can see above it clearly shows your total cost, and you can choose to either pay monthly or annually (which comes with coupon options), and you can pay either through your card or PayPal. If you don’t choose an add­on then it’s also fine, just click Save & Next. The next step is the part that people dread the most, the AWS console! I have had the misfortune of doing this without any solution to help me, and trust me it was an absolute nightmare! AWS have made a dashboard that is so busy that it’s almost impossible to navigate around it, it feels like you get lost in a maze every time you click something. 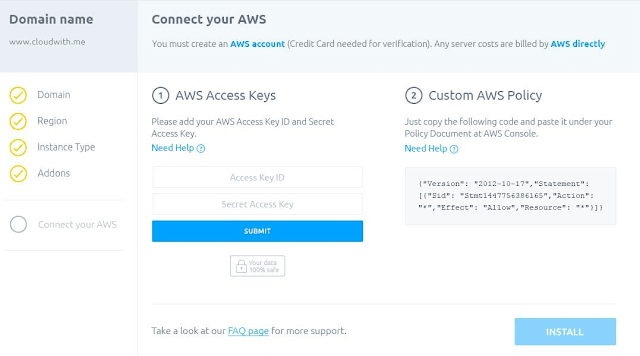 But below you can see how Cloudwith.me have really simplified this whole process, they have broken it down into just 2 simple steps and everything links directly to the section you need within your AWS dashboard. 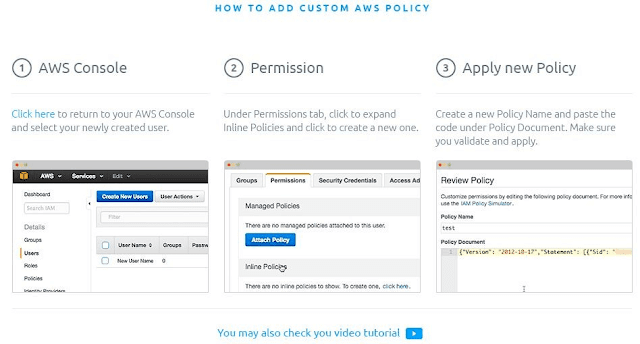 They also have created some nice pop­ups below to explain further for those who are totally inexperienced with AWS...they seem to have thought of everything! Once you input all your AWS details, Cloudwith.me take care of the rest. It took roughly just few minutes in total for my server to be installed, and I went to my dashboard so I could change my DNS settings. I think it’s worth noting that Cloudwith.me also provide you all these details so you don’t need to create it manually...like I said they really have thought of everything! It’s very important to be aware of is that any server charges are billed directly by AWS, not Cloudwith.me. It seems that Cloudwith.me are not a reseller of AWS, but more of a tool to help you move to AWS. 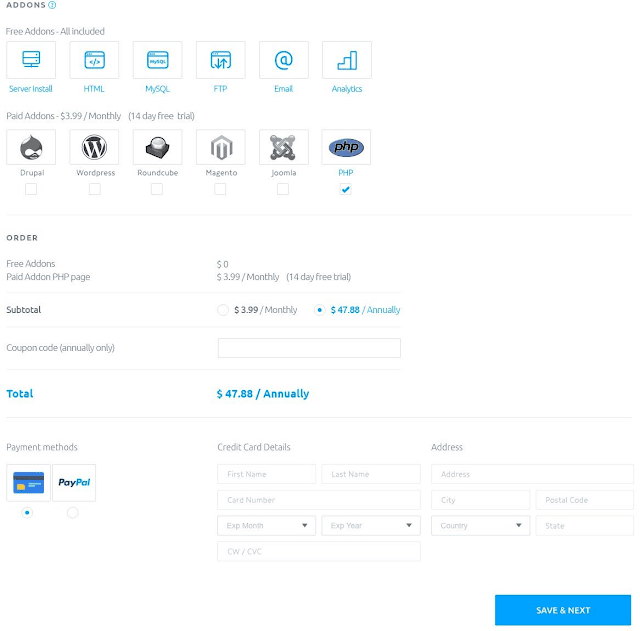 There are no hidden charges with Cloudwith.me, I actually set up a server with no add­ons and uploaded my Wordpress site using their free features, and another one that had Wordpress add­on. They only took payment for the Wordpress add­on, which I think is amazing, I thought for sure there would be extra costs. 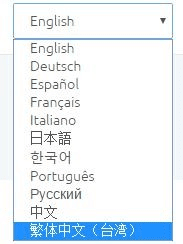 Another thing I want to mention that I really liked is that Cloudwith.me have made their solution multi­language and currently supports 11 different languages, more than even AWS (yes, I actually checked this myself, they only have their console in 3 languages!). To be honest, I think they could easily charge for this solution, so their add­on costs seem minimal for what you are actually getting. The solution is more than just moving your site to AWS, for those who don’t know all the messy work in the back can take up a lot of time and even money if you have to get someone else to do it for you. So I would highly recommend taking advantage of this tool while it’s available for FREE. There are several really cool features that Cloudwith.me provides as part of the free account. You can add up to five servers in the free account and nothing will be charged to you unless you choose an add­on of course. Below is the add­ons available, you can choose one or many as per your need, and I also asked them about bulk discounts for several add­ons or domains and they said they would create for me a special deal. I think that is pretty fair! Despite the fact that Cloudwith.me are only a startup, and according to interviews I have seen online they only have 5 people in their team, their customer support is fantastic! They are very helpful and friendly and helped me with any technical or product related glitches. It was clear that they really care about people who are using their site, and I offered some feedback which they were very happy to receive. Although I found it very easy to use Cloudwith.me, if you are facing any issues they have many video tutorials and articles available in their support section . If you don’t find an answer to your question, just get in touch with their support team and they will be able to get things sorted for you. They seem to have a very active Facebook page, and also are very active across most social media platforms. I didn’t have to wait long for someone to respond to me, and I had a direct contact who spoke with me on Skype to talk me through some of the features. What others say about Cloud with me? I read an article online that they have brought thousands of new users to AWS, and to be honest it comes as no surprise. Cloudwith.me is an amazing platform to simplify your move to AWS. The fact that they are an official Technology Partner of AWS shows that they are compatible with AWS standards and trustworthy. I would recommend you check Cloudwith.me out, and I hope this review was helpful. If you have ever used AWS or Cloudwith.me, do share your experience with us.